Doing Time is more than just a book. It’s an invitation from one of South Africa’s most revered pioneers and businessmen. It is an invitation to share in the memories of a man who knows the real meaning of ‘doing time’. With an added flair of humour and deep insight, Peter Vundla weaves together an informative and reflective year-by-year, blow-by-blow memoir. In this, his version of events, lies a story of dedication, focus and commitment. Peter Vundla is not afraid of hard work. He is not put off by challenges. 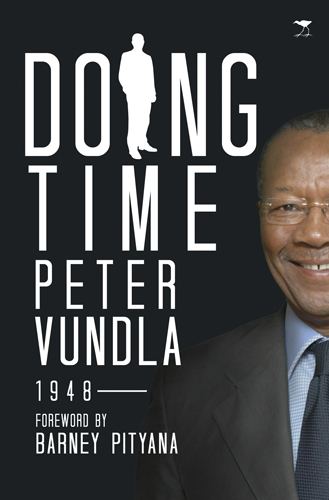 Doing Time sees Peter Vundla recount his time spent at companies like African Merchant & investment Bank, M&G Media Limited, Castle Lager, the Advertising Standards Authority’s (ASA) and the SABC. With decades of experience behind him, he is an advertising industry veteran. As the founder of South Africa’s first black-owned advertising agency, HerdBuoys in 1991, he is also a pioneer. Despite his industry know-how, and collection of awards like the National Economic Initiative Entrepreneur of the Year (1994), Black Management Forum Black Business Pioneer (1998); Fellow of the Institute of Marketing Management (2000); Tony Koenderman Long-Term Achievement (2002) and ABSIP Pioneer of Empowerment (2004) and others, Peter’s story is not about self-praise. It is a story about integrity, hard work, and pride in one’s country and people. Through his book, Peter Vundla uses his experiences in the advertising world to encourage people to be their own bosses and be in charge of their own destinies. Through the power of advertising as a force for change, he wanted to change the world.